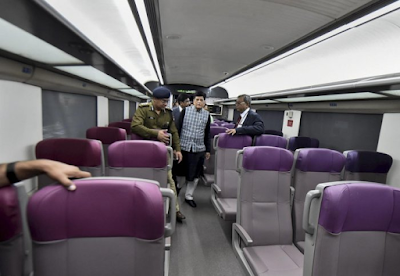 Today, Minister of Railways & Coal, Shri Piyush Goyal announced the name Vande Bharat Express for Train 18, acknowledging its made-in-India status. He called it a ‘vandaniya’ step towards realisation of New India vision. This train set has been manufactured by Integral Coach Factory (ICF) in the period of 18 months under 'Make in India' program. Since the launch of Rajdhani trains, Vande Bharat Express is the next major leap for Indian Railways in terms of speed and convenience. It is India's first semi-high speed train equipped with world class passenger amenities.